Being the Saviour of Highsec is interesting. It doesn't come with an instruction manual, and it's not the kind of thing they tell you about at the local job fair. One resource that I have found invaluable is my world-class intelligence network. They keep me apprised of everything that goes on in highsec. Ideally, I would know everything that everyone does, as well as everything that everyone thinks. liberty sent me a perplexing EVEmail. She blamed me for something. As an EVE rock star, I am often presumed to be responsible for things. I am alleged to have thousands of alts. FYI, unless the thing you're accusing me of is "saving highsec", I probably didn't do it. Bing Bangboom > yes, we are having great fun. Bing Bangboom > you have a very limited understanding of what being at war means. Centuries from now, soldiers learning about guerrilla warfare will still go back to liberty's basic analysis for fresh insights. liberty's latest bizarre EVEmail held more significance than any of us knew. 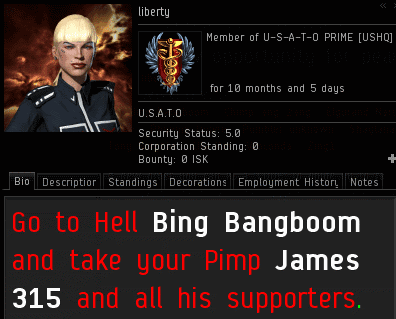 Bing Bangboom, the other recipient, launched an investigation after he was notified of U.S.A.T.O alliance's surrender. Bing reported on this at length in his celebrated "Cry 'Havoc,' and let slip the dogs of war" thread on the MinerBumping forum. 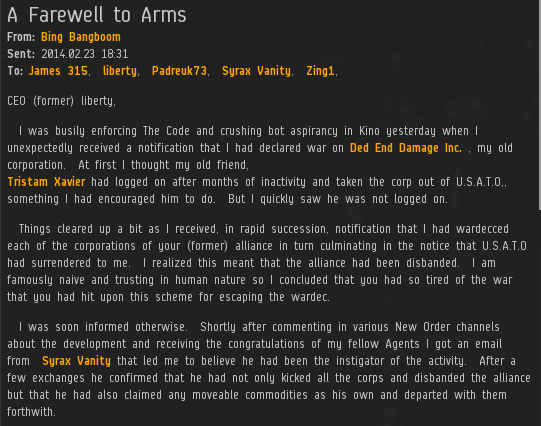 Syrax Vanity, a director, dissolved the alliance! 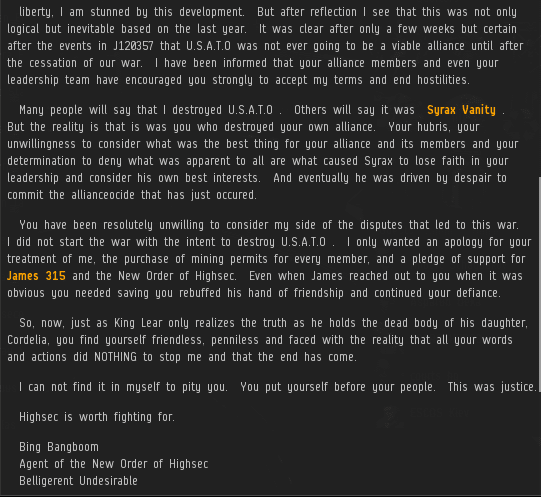 Bing my friend im not one to gloat your war victory is yours but know this I have destroyed the alliance and lib will be crying when he next logs in. Bing was amazed to hear this news. What would drive Syrax to do such a thing? Had he finally embraced the Code? I have been offline fo a couple of weeks and thought i would come on and see what was happening and again im in solertary so stuff it. He now knows the feeling of karma as they say what go's around comes around. As of tomorrow at around 17.00 it wil be a 2 man corp with nothing but a name. yea festing greetings allright here from liberty thats for sure been hard xmas n harder first month or so but then to find out you just did us over syrax why dude just tell me that why is it pure greed or it case u been payed off by new order too try and close us down just a simple understand is all request liberty. More appropriate words could scarcely be spoken. Liberty: Alt of Ankhsucksemenwhatever? James 315 reports, you decide. "Due to the sandbox nature of EVE as a game designed around player-created conflict, acts of piracy, warfare, nonconsensual pvp, ganking, scamming and theft are not seen as exploits by the developers of EVE Online, as the opportunity to do so is built into the game mechanics." 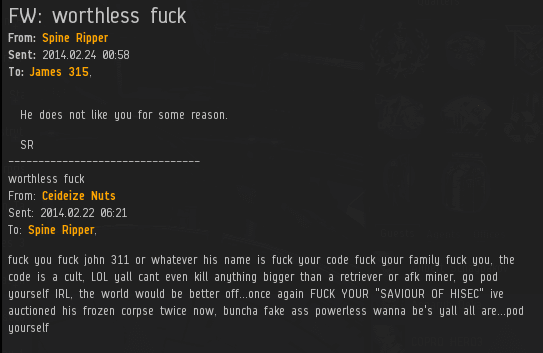 So, CCP encourages and promotes this kind of behavior in the game. "CCP encourages and promotes this kind of behavior"
No, they allow it. Please go back to school and learn the difference. Also please search for information on "sandbox game" and learn what that entails. No, they encourage it. EVE was built from the ground up to be a PvP sandbox where players weren't simply dumped into one of two teams. Instead, players may choose their own friends, their own enemies and even start their own wars ***for any reason they deem fit***. 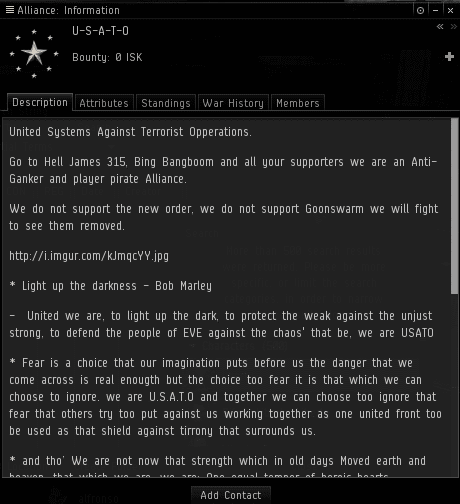 James 315 declared war on bot aspirancy, Bing Bangboom declared war on U.S.A.T.O, each for their own reasons. Anslo, a famous rebel miner who's efforts petered out a year ago declared war on the New Order, again, for his own reasons. I believe Anslo was wrong in his judgement, but he partook in one of the key elements of the most unique game on the market today. If you don't like the New Order and what we do, that's fine. Start a resitance against us and try to help miners resist and even destroy us. You are more than welcome to try, not only by the New Order, but CCP too. Don't sit there denying that the New Order is doing anything but exactly what this game was designed to encourage people to do. It is truly a shame thet you completely & utterly fail to appreciate the scope and potential of the awesomeness that is EvE. Your lack of imagination should not be used as a guide as to what constitutes acceptable legal gameplay. No, they allow it. Please go back to school and learn the difference. Seriously, just try it. I'm sure it's within your capability. CCP also created the local chat channel, but that doesn't mean they encourage profanity, racism or sexist abuse that the likes of you or others post in local. "If you don't like the New Order..."
eh? Stop making stuff up will you. "Don't sit there denying that the New Order is doing anything but..."
I said stop making stuff up. If you can't, how's about just being quiet like a good little boy? "I said stop making stuff up. If you can't, how's about just being quiet like a good little boy?" Wrong again. Saying it over and over again doesn't make it any less wrong. Try qualifying your arguments with logic and cite your sources. "CCP also created the local chat channel, but that doesn't mean they encourage profanity, racism or sexist abuse that the likes of you or others post in local." Actually, NO have consistently been courteous in local and just about every medium. I've seen all manner of vile abuse hurled at NO agents from rebels, ranging from petty insults to real life death threats. Hell, this very blog you're commenting is a massive archive of many such conversations. You'll be hard pressed to source any hateful comments coming from NO agents. Go on. Prove me wrong. Find chatlogs and images of NO agents being as vulgar as you've claimed. ""If you don't like the New Order..."
eh? 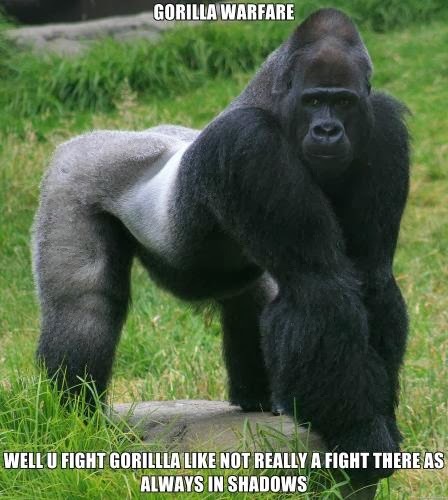 Stop making stuff up will you." IF. IF you don't like the New Order. If you like NO, then you don't need to do a thing. Be Code compliant (seeing as you're a miner/minor) and laugh at the idiots that get themselves blown up. "I said stop making stuff up." I'm not. You said that NO are doing things that CCP merely allow, rather than encourage which, isn't the case. Of course if you can prove me wrong on that front, you're welcome to try. "hurr durr try going to school" isn't exactly mature debate. Saying it over and over again doesn't make you right. Try qualifying your arguments with logic, reason but above all for you, honesty. "Find chatlogs and images of NO agents being as vulgar as you've claimed." Oh dear. Me telling you to stop making stuff up isn't working as you're still doing it. Show me where I claimed NO agents are being vulgar. You can't because you are a liar who makes up ridiculous strawmen in the hope you'll sound "right" when you knock them down. If you want mature debate, try starting with honesty and stop lying. It's a wonder that anyone would ever believe anything you ever say. 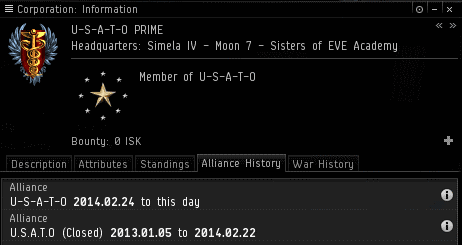 You need to prove that CCP promote high-sec ganking. That is what you assert so the burden of proof lies with you. I'm saying the sandbox allows for such actions (which it clearly does) but they aren't necessarily promoted by CCP. Just like being racist is possible within the sandbox but isn't promoted. "hurr durr" indeed. "Oh dear. Me telling you to stop making stuff up isn't working as you're still doing it. Show me where I claimed NO agents are being vulgar." "that doesn't mean they encourage profanity, racism or sexist abuse that the likes of you or others post in local." 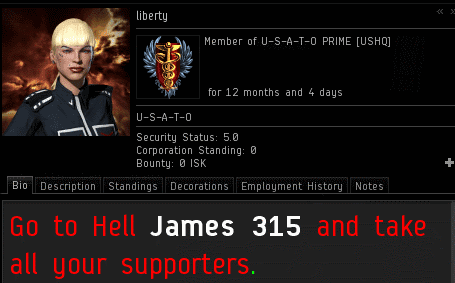 "You need to prove that CCP promote high-sec ganking. That is what you assert so the burden of proof lies with you." http://www.eveonline.com/sandbox/pirate/ Right there, on eve-online.com, CCP have put together a list of professions players are free to choose from. Ganking isn't just allowed, not even simply encouraged either, but is actively being promoted as a selling point of the game. a) "Show(n) me where I claimed NO agents are being vulgar." b) "prove(d) that CCP promote high-sec ganking"
For (a) to be even remotely true, I'd have had to of mentioned NO before your ridiculous lie. It's clear to anyone with a basic grasp of language that you made that whole NO = vulgar thing up. It's more likely to be your view than mine given that you originated that thought in this thread. Shame on you. Your proof for (b) is that the obvious possibility of being a pirate in a sandbox game = CCP promoting high-sec ganking. Even a simpleton can see how ridiculous your claim is there. I'm guessing that is your very best effort so I think I'll stop wasting my time. So long anonymous misunderstander of the sandbox concept. Well, I was hoping we could've had an adult conversation. Good luck in your future endeavours. Hmm, minor. You did mention the racism, profanity "the likes of you or others post in local" HEAVILY implying the NO as "An Agent" is an agent of the NO, and the "likes of him" would also be agents. My proof of CCP promoting piracy is when CONCORD returned a Catalyst I had used to gank a mackinaw back to me. Da hell? How'd that happen? "Centuries from now, soldiers learning about guerrilla warfare will still go back to liberty's basic analysis for fresh insights." Our clients service works 24/7, so don’t hesitate to call us anytime you need. Students have a wide range of activities to spend time on and finding hours to complete an assignment becomes a real problem. But when you choose the right writing service everything will be OK, so stop worrying, have a glimpse at this link to find more!